McDonald's Peddles New Smoothies via Olympians. There are two new smoothies set to show up at McDonald's nationwide by summertime. "The Golden Arches are going for the gold with McDonald's new fruit smoothies, which the company will serve in its Olympic restaurants in Canada at the Winter Games. The fast-food giant unveiled its Strawberry Banana and Wild Berry Real Fruit Smoothies on Thursday at the Olympic media center in Vancouver." 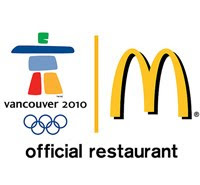 They also report that McD has been sponsoring the Olympics since 1976. Fast food and world class athletes, where's the connection, I don't see it. From the looks of the Olympic smoothie-unveiling press photo on Slashfood, there appears to be fresh fruit (bananas, kiwi, strawberries), yogurt, berry juice, OJ, apple juice (not fresh apple juice), honey and maybe even PB and J. You can see the photo here. I seriously doubt McDonald's will be making its smoothies with so many fresh ingredients. Fresh strawberries and kiwis at McDonald's? No way. I mean, last time McDonald's tried to launch fruit smoothies, they weren't even vegetarian - because they contained gelatine, according to several calorie count websites. "It gives us a great platform to highlight our food quality," McDonald's global chief marketing officer, Mary Dillon, said about the Olympics. Dan Coudreaut, a five-star chef and director-culinary innovation at McDonald's, said the Olympics lets the brand tell "another chapter of our culinary story." After six years at McDonald's he said he still has conversations with people who are shocked that "we make our hamburgers with 100% beef," or that the chain's parfaits are made with "real yogurt."" Low Fat Yogurt: Cultured pasteurized Grade A reduced fat milk, sugar, food starch-modified, fructose, whey protein concentrate, corn starch, kosher gelatin, natural (plant source) and artificial flavor, potassium sorbate (added to maintain freshness), artificial color. So if these new fruit smoothies include yogurt, just like their current parfait's, or if they contain gelatine, they won't be vegetarian. note: there are a few "kosher gelatins" that are actually the vegan seaweed product agar-agar. But my research shows that McDonald's kosher gelatin does come from "animal sources". another note: I did not consult McDonald's on the smoothies since they are not officially released yet. Once they launch, I will update you on their official nutritional status. But really, McDonald's: leave smoothies alone! Last note: Yes, I realize that a "smoothie" is a healthier option than a large chocolate shake. But if someone is at McDonald's and wants a shake, I don't think a berry smoothie will be championing that "shake vs. smoothie" craving decision. I'm pro-healthier food at any fast food place. But it's fast food, not exactly an industry known for its high quality ingredients, environmental responsibility or effective nutritional priorities.